Leaving other countries in its wake, Germany has been a trailblazer in the shift towards renewable energy in recent years. Chancellor Angela Merkel, in an ambitious turnaround in energy policy, vowed to phase out nuclear energy by 2022, favoring renewable resources in an effort to curb climate change. While the policy, called Energiewende, has yielded considerable results, the public’s reaction has not been as positive. Energiewende’s strain on the economy is at the forefront of its criticism: taxpayers are funding a significant portion of the transformation, the government-subsidized renewable energy industry is pushing traditional energy companies out of the power market and disrupting the stock market. In addition, great fluctuations in electricity production from wind and solar forced Germany’s transmission system operators to introduce costly measures to ensure grid stability. And despite all advances, the estimated greenhouse gas emissions in recent years have actually risen, as drastic cost reductions have encouraged Germany’s existing power plants to resort to a cheaper and dirtier type of coal. As a result, energy policy is likely to be at the forefront in the coalition negotiations following the upcoming federal election. 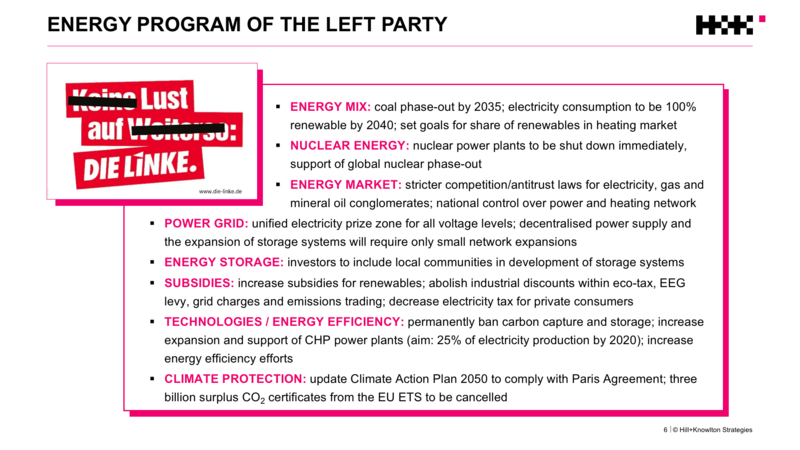 H+K Germany lays out a run-down of the parties in play, their policies, and what is at stake. The election, to be held on September 24, is predicted to involve six key parties: CDU/CSU (the party currently in office), SPD, FDP, the Green Party, the Left Party, and the right-wing party AfD. Polls during the month of August place CDU/CSU in the lead with 37–41% of the popular vote, followed by SPD with 21–25%. The “grand” coalition has been the constellation of two recent legislative periods (2005-2009 and 2013-2017). As the main topics and opinions of the two major parties in Germany have not been too far apart in recent years, this coalition might not face as many obstacles in coalition talks as other co-operations and might continue its work regarding energy policy like before. Next actions are likely to include more concrete climate action plans. However, the SPD base feels very uncomfortable regarding a continuation of the “grand” coalition, as it is seen by many as eroding the SPD’s position in the long run. 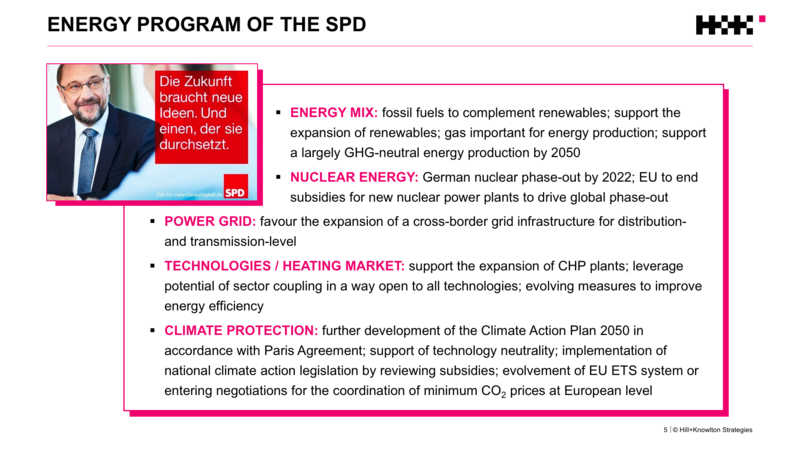 A coalition between the CDU/CSU and the FDP would be the most friendly one towards conventional energy sources. 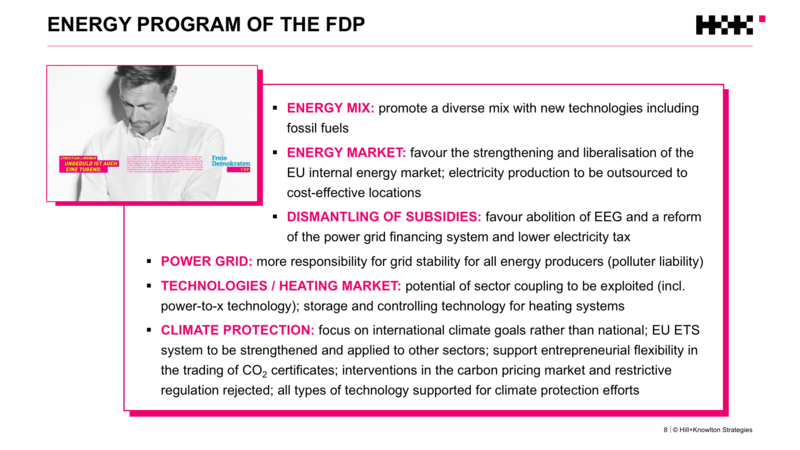 This cooperation would be unlikely to result in a quick coal phase-out or an exit from nuclear energy by the envisioned end date of 2022, as the FDP would use the slow grid expansion and the lack of energy storage options to make the case for conventional energies. Industry-friendly reforms of energy taxes and levies are likely, while climate efforts will focus on tech-friendly market solutions and the potential from the coupling of sectors. 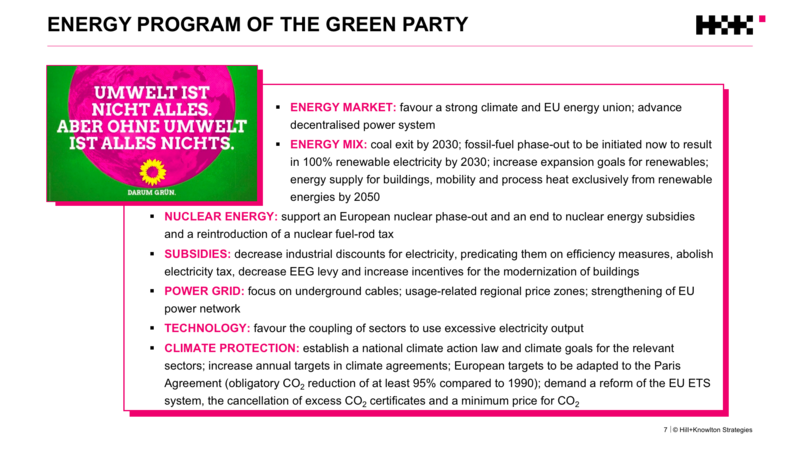 A coalition of the CDU/CSU and The Green Party would see great friction over energy and environment topics. 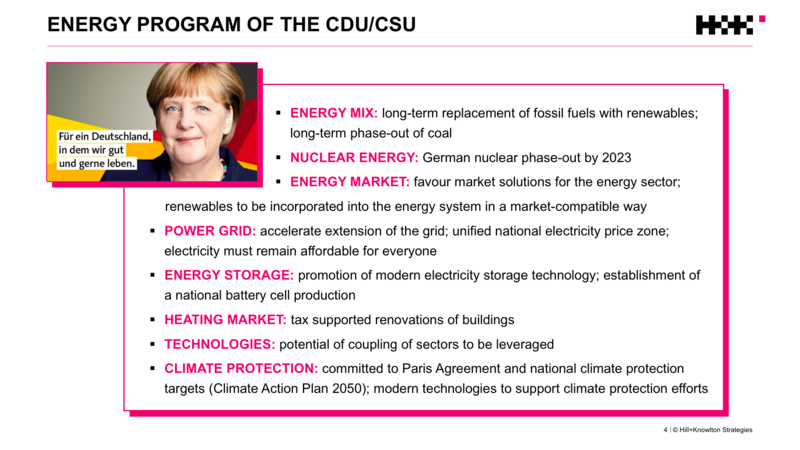 The CDU/CSU would have to make concessions to the Greens regarding climate policy: concrete plans for a coal phaseout, a reform of the EEG, a revised climate action plan and stricter carbon reduction measures are imaginable. Nevertheless, this coalition would mean a great reputational risk for the Green Party as they would have to compromise on many of their campaign promises. A coalition between the CDU/CSU, the Green Party and the FDP is among the most complicated options. In this scenario, the Greens might face most challenges concerning their ambitious climate protection and anti-pollution policies. A continuation of the subsidies for renewables and the promotion of sector coupling efforts might function as compromises in this diverse setting. To read a more comprehensive survey of the upcoming German election and predictions on policy surrounding infrastructure, energy and digitization, click here.